Day 23 – The Mother Road. 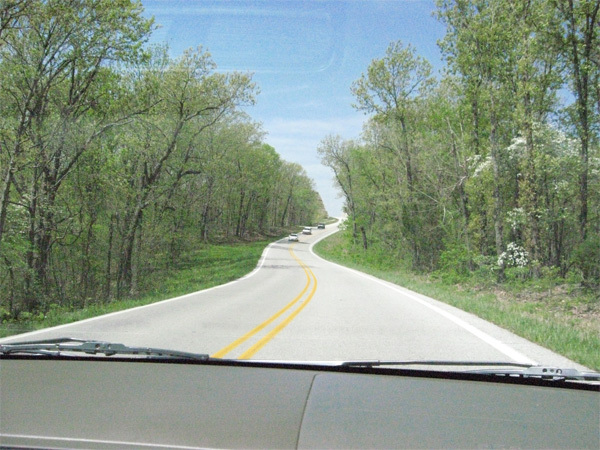 Leaving Eureka Springs AK and heading towards Rt. 66. “The Mother Road” that will guide our way back home. California Here We Come. We decided to cross over using the Scenic 412 into OK and on to Tulsa, where we were going to pick up Route 66. 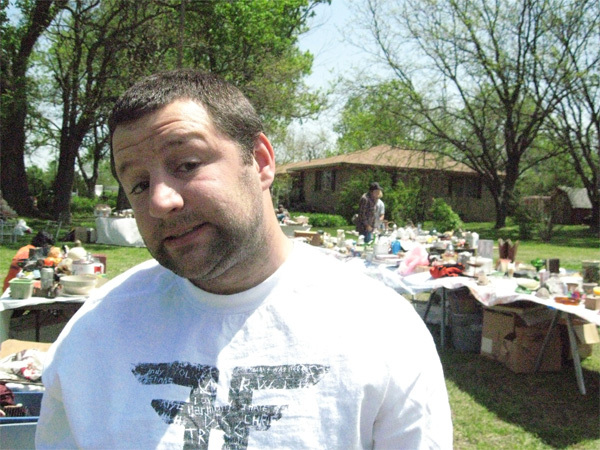 On our way we stopped at a yard sale... it was a gem! Although we didn’t buy anything it was an antique-hunters paradise. It looked like a closet clean out from 1950… Such cool stuff! We made it to Rogers, AK and found this super cool little drive in diner, too bad the best thing about our visit was the sign. We had a quick lunch and I had to try the fried pie, which turned out to be a processed “home run” like pie deep fried and still cold inside. Sadly, this place is NOT RECOMMENDED! I was bummed that we missed a few road-side attractions; First, Dinosaur Land was closed and then we just plum got lost in Tulsa and missed the giant, Blue Whale. 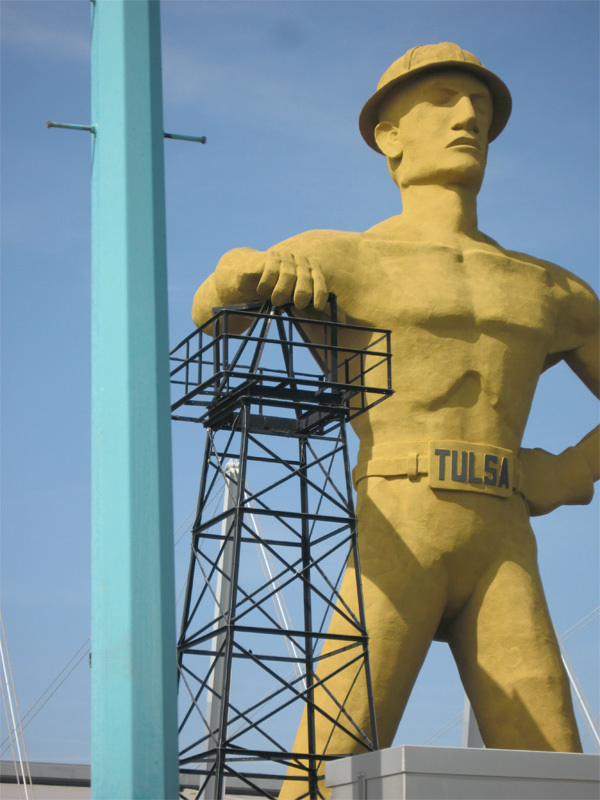 I’ve noticed that we, Americans have a fascination with giant, road-side, sculpture. Pigs, Whales, Dinosaurs, Presidents, Jesus’… whatever, just make it BIG and make it wave! This guy greeted us in Tulsa. It’s hard to see the scale here but the building near his knees is the front of a large sports Stadium. On the road again, we found our way out of Tulsa, got a wee bit lost trying to find the West bound Route 66. 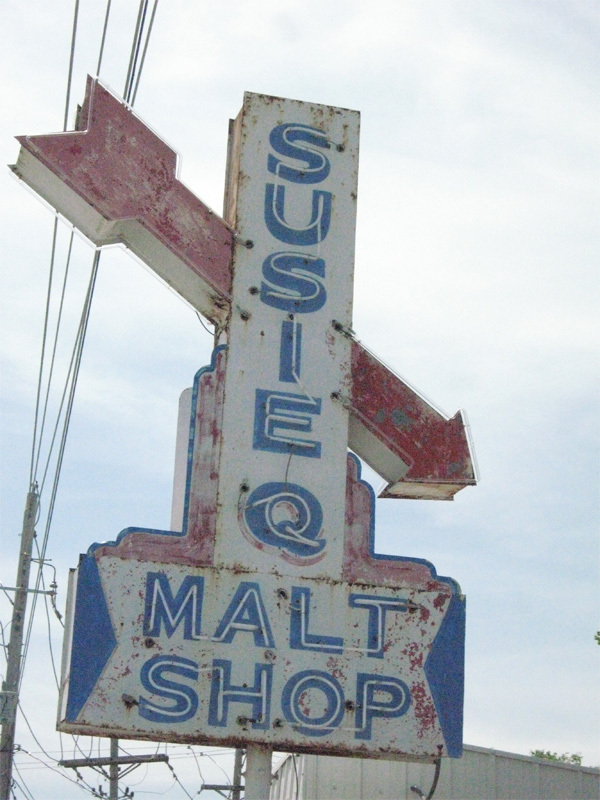 When we finally got on track, we were not disappointed to find more of the great American Main Streets... the first places we hit on Route 66 were Supulpa, Bristow and Stroud. We decided to stop at an Historic eatery in Stroud along Rt. 66 called Rock Cafe. What a great place with a perfect American tale. 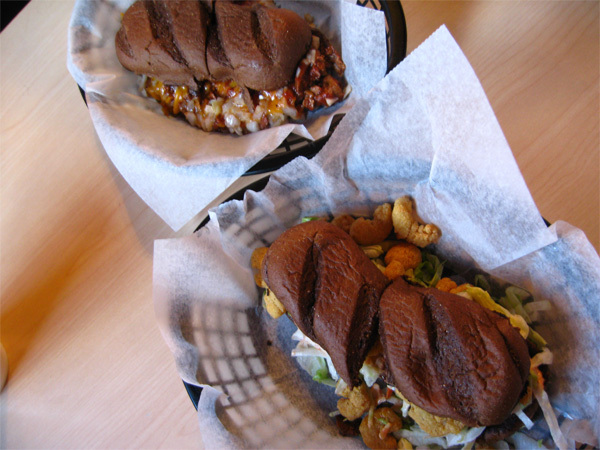 We had sandwiches… I had the fried shrimp Po’boy and Dennis had a BBQ Beef with onion and cheese – on wheat!. The addition of cheese and chopped onion was a “nice touch” he said. 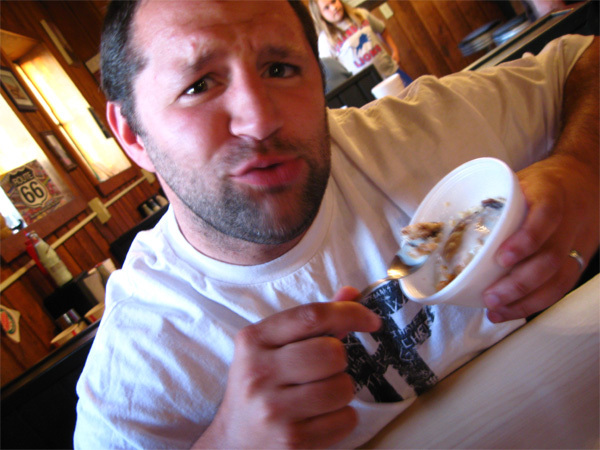 But the BEST part was the home made Bread Pudding… I’m a sucker for any dessert with booze in it! And how could I resist that face! 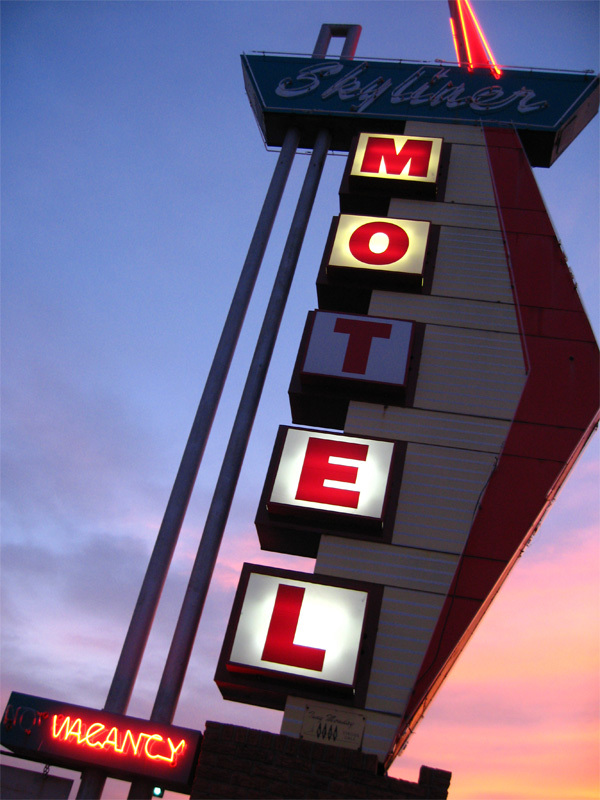 After a long journey our bums were hurtin’ so we searched out some classic motels… with cool signs of course! However we got a tip… the “classics” in this town are, well, quite an experience. Uhm? So we heeded that advice and checked into the Best Western near by. For a mere ninety bucks we got a clean room with a giant jacuzzi tub. Ahhh. 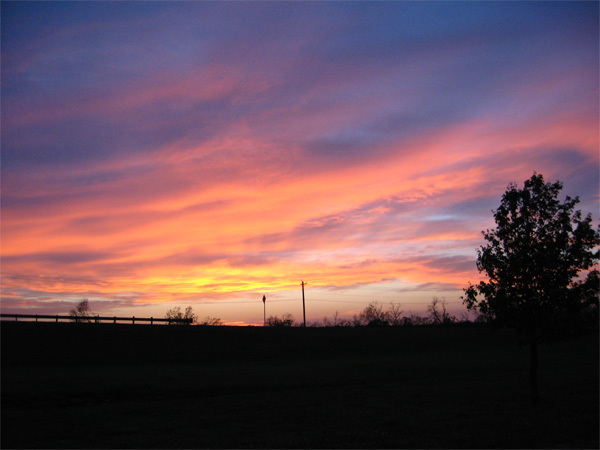 The evening ended with a BEAUTIFUL sunset over the Oklahoma horizon. « Day 22 – Jesus Christ…Thats Tall! you know the old saying, BUILD IT BIG , AND THEY WILL COME. i think thats why , in the early days of california or bust , people got stuck in nowhere places and had to make a living, hense eateries and no tell motels. go west young man! I could do this forever… it’s the circus in me I guess! It’s crazy that we’ve had a month and still had to miss so much along the way. We left Memphis early and didn’t get to do all of your recommendations and we also missed Nashville and the rest of TN all together! Maybe we’ll just get our own airstream and stay on the road forever!